Please do not arrest me for the spoilers. Imagine if you will, a film that tries to take the movies Men In Black and Ghost and turn them into a buddy cop movie with a hint of Ghostbusters but less funny. 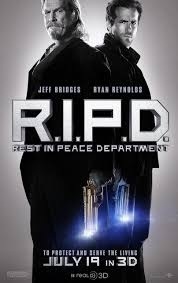 This is what you get with R.I.P.D. Can two dead cops from totally different eras come together to save the world from the “ham” that is Kevin Bacon? Everyone see what I did there? While the characters can be endearing and a few clever moments are sprinkled throughout, this movie never rises above being more or less generic and checks off every buddy cop cliche’ that’s been used since the first Lethal Weapon. The plot is very basic here. Ryan Reynolds plays a good cop with a moral dilemma betrayed by his crooked partner who has an utterly predictable plan to,brace yourself, take over the world. Or at least overrun it with an army of the dead. The villain is played by Kevin Bacon in a criminally under written part. Even acting skills such as his cant bring to life such an ironically lifeless character. Ryan Reynolds and Jeff Bridges do have nice chemistry as partners but the movie just kept throwing them into one half baked scenario after another with plot contrivances appearing as they were needed with no thought to narrative structure. The film does have particularly funny moments when our lead characters are shown in their alternate forms, an elderly asian gentleman and a tall blond bombshell. These moments are underused however and only for brief comedic effect. The film is so short and reaches to far beyond its grasp to create a convincing world that plot threads get brought up and not resolved and the CGI in this film ranges from mediocre to down right abysmal at times and only serves to take one out of the film. All in all this was a goofy, silly time at the movies that you could wait for a boring night to watch on DVD. This entry was posted in comic books, Movies, reviews and tagged comic book movies, Jeff bridges, reviews, Ryan Reynolds. Bookmark the permalink.